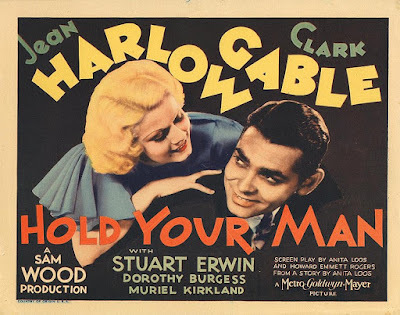 “Hold Your Man” was the third film featuring Jean Harlow and Clark Gable, the follow-up to 1932’s “Red Dust”, an inconsistent yet nevertheless entirely memorable spate of pre-Hays Code ardor in which the Platinum Blonde spent most of the film aggressively flirting with her male co-star. That they wound up in each other’s arms at the end might have been a nod toward morals, but the overall movie is most remembered for its un-subtle salaciousness. And, for a little while, “Hold Your Man” suggests it might be going down the same road, what with the true enforcement of the Hays Code still a year or so away. Why director Sam Wood goes so far as to sort of re-create “Red Dust’s” most famous shot of Harlow in a tub by placing Gable in a tub instead, though it’s played more for comedy than for, ah, passion. That’s emblematic, however, of the confusion at the heart of “Hold Your Man.” Wood’s film is by far best in its early moments, when small-time thief Eddie Hall (Gable) infiltrates the apartment of Ruby Adams (Harlow) to evade the cops, which might technically be breaking and entering though it’s difficult to quibble on any real-world level in the face of the stars’ emergent magnetism, which appears onscreen like the click of a butane lighter, once Harlow and Gable get a look at one another, with her playing hard to get and him smiling back like he’s willing to play along for the rest of his life. Sigh. If only. This apartment opening comes on the heels of a set-up with an air of authenticity. A wallet falls on the ground where Eddie and another fella pick it up and fight over the cash contained inside. The whole thing is a con, evoking “The Sting”, but that desire for cash, any cash, taken in conjunction with the conspicuously grim set design where For Rent signs dot the background buildings, is not turning a blind eye to the Depression, which even gets name-checked later. And both Eddie and Ruby, as we see her later working the angles with a guy that she doesn’t really love in an attempt to keep her financially afloat, are characters that have fallen through the cracks in the wake of economic disaster and are fighting to hang on. It might have been an interesting angle to see the whole way through, particularly because the movie does desire to get serious, just that it gets serious in a different way. “Hold Your Man’s” real turn toward morals comes when Eddie and his partner in crime Slim (Garry Owen) decide to full a fast one on a married drunk with eyes for Ruby, blackmailing him into a payoff, though at the last minute Eddie decides to pull the plug because he can’t bear the thought of it. That leads to him proposing marriage to Ruby in one of those line readings that Gable strips of any romance for pure gruffness instead, which turns it deliriously, delightfully comical, and which Harlow has Ruby meet with that patented stuttering sentimental bamboozlement. But rather than explore these two lovebirds getting hitched, the script takes a turn for dark melodrama, forcing Ruby to take the fall when their would-be mark winds up dead. She is sent away to a woman’s reformatory, and when she is, the movie mostly moves Eddie out of the picture, leaving her on her own. It might have been a really good idea, and you can see specks of it, where these many women in Ruby’s company seem to have suffered at the hands of men, men who have subsequently abandoned them and left them to rot, and where these no good men, intentionally or not, pit these women against one another as evinced by a past gal of Eddie’s who naturally winds up in the same reformatory as Ruby. This allows Harlow to employ her distinguished aptitude for self-pity, particularly when one of her pre-Eddie beaus turns up pledging to cut a deal to get her released if only she’ll marry him. Harlow lets her body virtually tremble as she listens to this pitch. It’s a moment when you think Ruby might well be about to take possession of herself. But, of course, this is a movie where the heroine can only achieve said status by conforming to the patriarchy, meaning she still has to marry anyway, just to Eddie, who, in essence, busts into prison while on the lam in order to say “I do” to the woman he loves. And even if my modern eyes might have liked to see this movie forge some excitingly unforeseen ending rather than a climactic marriage, well, sometimes the rote is still, on account of the players involved, resplendent.